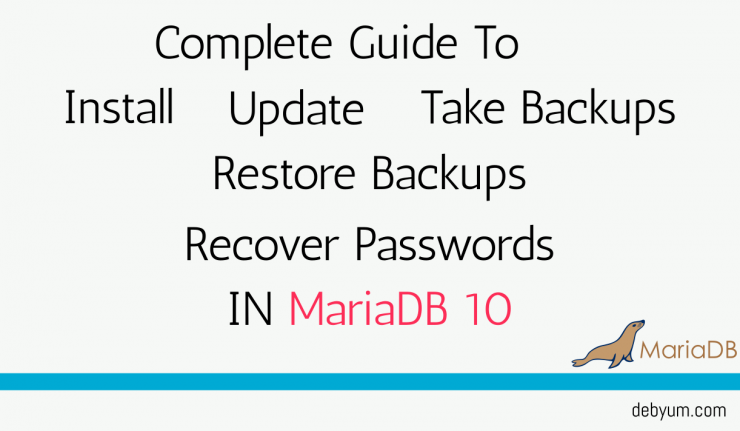 Complete guide to Install,Backup & Restore,Set password in MariaDB 10. HomeLINUX/UNIXComplete guide to Install,Backup & Restore,Set password in MariaDB 10. MariaDB is a truly Open Source Database management system created by MySQL’s original developers in 2009 after MySQL was acquired by ORACLE. MariaDB is maintained and supported by MariaDB Foundation and community. It is currently in use by many organizations for example Mozilla Corporation, Wikipedia, OpenSuse, Fedora, The Chakra Project to name a few. For more info go to List of companies/organizations using MariaDB. MariaDB is easy to install and configure is currently the default database Management system in Centos 7. MariaDB is recommended for its official support. Current MariaDB version which can be used with CentOS 7 is 10.1.17 but the one provided in default CentOS repositories is 5.5.x. Here’s a brief summary of what you will find in this article. Backup of Single MariaDB Database. Backup of Multiple MariaDB Databases. Backup of all databases at once. Restore a Single Database Backup. Setting up a Password for MariaDB. Updating the MariaDB from MariaDB 5.x to MariaDB 10.x. In order to use the latest version of MariaDB we need to create a repo file in /etc/yum.repos.d directory and enable that repo. for MariaDB. As we have created a repo. for MariaDB , we can easily install Latest MariaDB. Update the system and then install the MariaDB client and Server. Enable the MariaDB to start at boot and then start the MariaDB service. Starting MaraiDB and Double-checking its status. We need to secure the Database server by running this script ( mysql_secure_installation ) in the shell. Backup and Restore MariaDB database. Creating Backup of MariaDB Database. It is very important in server administration to know how to take Database Backups and Restoring them. We can use mysqldump command to create dumps of databases managed by MySQL. Dumps are nothing but a file containing all the necessary commands to recreate the database. Also creating and restoring dumps is really fast and easy. You can either create a dump of all the databases one by one or all at once. Create Backup of a single database. Let’s say, For example, we have multiple databases from database_01 to database_30 and we want to take backup of database_11 only, then we need to apply this command. Create Backup of multiple databases in MariaDB. We will use –databases option to mysqldump for creating multiple databases backup. We can take backup of all our databases by using –all–databases option to mysqldump. --password - The password for this user. If you are using Global Transaction Identifier’s (GTID’s) with InnoDB (GTID’s are not available with MyISAM), you should use the –set-gtid-purged=OFF option. Note : mysqldump does not dump the INFORMATION_SCHEMA database by default. To dump INFORMATION_SCHEMA, name it explicitly on the command line and also use the –skip-lock-tables option. Back Up MariaDB Database with Compression. Now that we know how to create the Backup of Databases, Let’s restore them. To restore a MariaDB database backup, we need to create an empty database first. In addition to that, we can also use a one-liner like. shell> mysql -uroot -p'root_password' -e "create database database_01"
sometimes permissions on various folders can cause problems in restoring. To prevent that try copying .sql files to /tmp directory first and then apply restore like this. Matching names ( database_01 ) is not compulsory but advised. This simple command will restore all of your MariaDB databases with ease and your existing databases in MariaDB will be preserved. 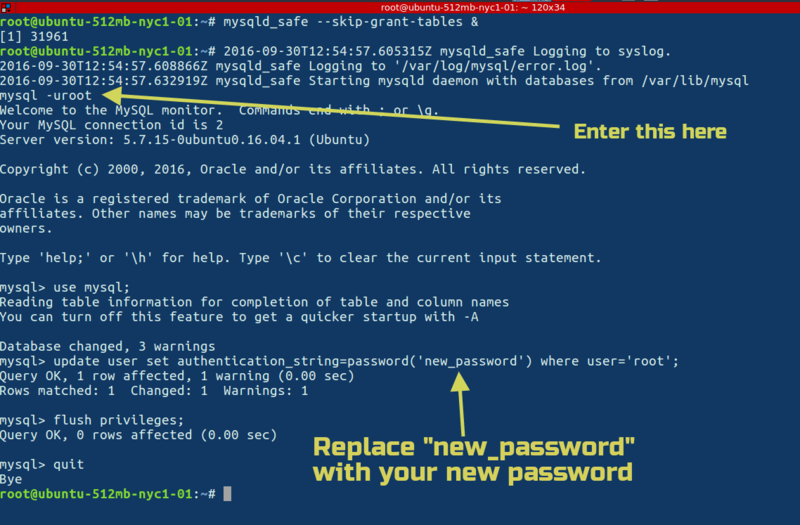 Setting up Password in MySQL is very easy. Setting up Password for the first time. Setting up a password is very Important for the protection of your Databases. Update your old password with a new password in MariaDB using this command. To learn more about how to recover password in MySQL 5.7, Read this article. If you have lost your MySQL/MariaDB password then you can restore it easily. All you need to have is root access to your server. So let’s start recovering MySQL/MariaDB password. First of all, Log in as root and stop the mysql process. Now, let’s start the mysql daemon with skip the grant tables & option. Log in to the database using our new password. Taking the full backup of all databases. Take a backup of MariaDB data directory. Remove old MariaDB 5.x packages via yum command. Now Take a full backup of all databases before proceeding further. Taking the backup of my.cnf and my.cnf.d. Taking backup of /etc/my.cnf.d/ in /root directory. Now we can remove packages. Now we will remove old MariaDB 5.x packages. For that, we need to find out the list of MariaDB packages already installed on our server. Before removing anything , first stop the mariadb.service. Now remove these packages via yum command. Now we can install latest MariaDB 10 , or you can take another look at this post from start. Start MariaDB and update data files. To Check the version of MySq use. To sum up, if you are looking for a modern and secure database then MariaDB can be a good choice. Again, I have tried to cover all the concepts with their examples. Still, if I have missed anything please update us through comment box. I will keep updating the same based on feedback’s received. Good day.